Tired of seeing the same faces in the Mumbai Comedy scene? Had enough of Dadar, kurla, local train & vad pao jokes? Well this is a show by the Hive where comedians visiting Mumbai perform. These people have been honing their acts in their hometown for years and are now showcasing them in Mumbai, every Thursday at the Cuckoo Cafe. 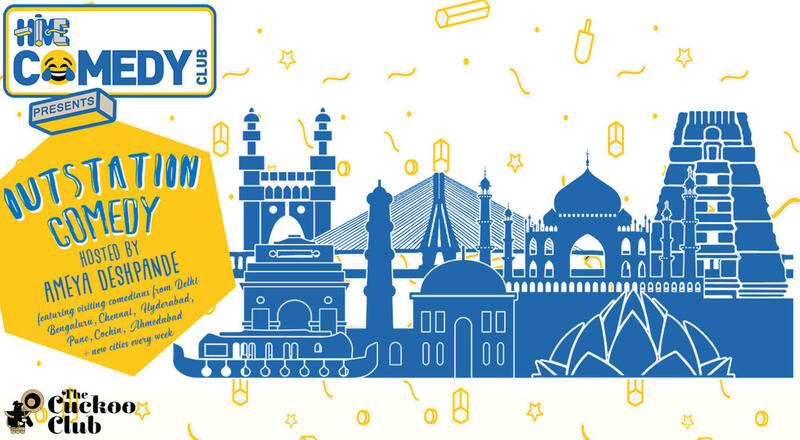 Broaden your cultural iq with humor from around the country and join us at the Hive in supporting a growing stand-up comedy scene that features comedians from Chennai, Bengaluru, Hyderabad, Surat, Delhi, Nagpur, Pune, Kerala, Ahmedabad to name a few of the cities whos comedians have performed at the Outstation stage. There’s a cover of 100 rupees which gets you a tasty drink or snack at the cafe and helps us to keep both the comedy scene and the venue running!